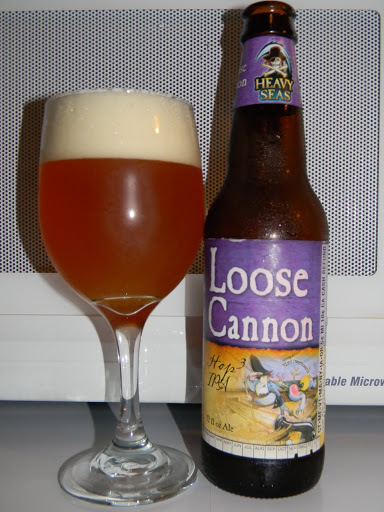 Review of Heavy Seas Loose Cannon Hop3 IPA | Beer Apprentice - Craft Beer News, Reviews, Interviews and Info. Today I’m going to sample a beer from a company, of which I was surprised I had not ever posted a review. The brewery is the Clipper City Brewing Co. located in Baltimore, Maryland and the brew is the Heavy Seas Loose Cannon Hop3 IPA. I have tried several Clipper City brews and have found them to be most enjoyable, so when I saw this sitting in the fridge, I figured I’d give it a go. The website, hsbeer.com, has a nice description of the Loose Cannon Hop3 IPA. Burnished gold with a rich citrus hop aroma, it is wonderfully drinkable with a big hop flavor. We’ve nicknamed it Hop3 (hop cubed) Ale to reflect the enormous amount of hops in this beer: over 3 pounds per barrel! It is hopped 3 ways: in the kettle, in the hop back, and dry hopped. Pairs well with strong cheeses and steak. 2nd Place CAMRA award winner at the 2010 Great British Beer Festival. The Hop3 has an ABV of 7.25% and comes in a 12 oz. bottle. Poured into a wine glass, this slightly hazy beer showed a very nice, golden/orange to amber color. The cap, an off white color, was soft, fluffy and creamy. It had outstanding size, very nice retention and some very good lacing. After a while it settled to a thick film on top. The smell produced aromatics of a prevalent pine along with some citrus of pineapple, faint tangerine, light grapefruit and orange zest. A relaxed brown sugar and caramel note hid underneath, however they were not insignificant nor overlooked. Tones of a fresh bread made an appearance also. I, literally, smelled no alcohol. This brew had a very nice and even aroma. The taste started with an adequate hop “bite” and “kick.” Nice and “piney.” More than enough bitterness for any craft beer drinker I thought. Citrus of grapefruit, pineapple and orange. Maybe even some mango. As the brew warmed considerably, I noticed that the orange became the dominant fruit. A breadiness and sugary caramel became more evident also. Only the slightest bit of alcohol was tasted. It was almost like a faint, clear liquor. Again, well balanced and tasty. The mouthfeel was medium, smooth, very dry, crisp, snappy and refreshing. A very nice amount of flavor was left behind along with a suitable warmth at the back end. This, like other Clipper City/Heavy Seas brews I’ve had, was a very, very good beer. One I would classify as a “sleeper.” It has a worthwhile appearance. It’s very aromatic and has a great taste. It’s highly drinkable even with the higher ABV. I’m sure glad I tried it and I would recommend that you do the same. If you favor a well balanced, generously hopped beer, then this one is for you. It’s not quite as robust as other IPA’s, but I don’t think you will be disappointed with it. A solid and sturdy brew for sure. Have you ever tried the Loose Cannon Hop3 IPA? What did you think of it? Please feel free to leave a comment and let me know.